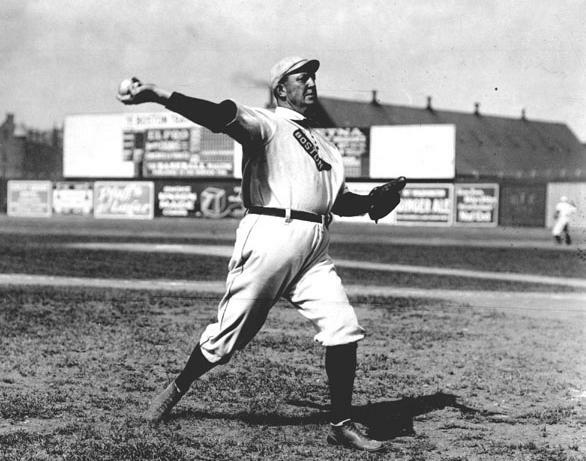 No pitcher will ever equal the 511 wins chalked up by legendary hurler Cy Young. They say that records are made to be broken. But there are exceptions to every rule. These 10 baseball records (and some related ones) will never be broken. Young’s record spanned the 1890s and baseball’s modern era. To break this record, a pitcher would need to win 25 games for 20 years…and even then, he comes up a dozen short. Next closest is Walter Johnson with 417 wins. Some other pitching longevity records that seem certain to withstand the test of time: Jack Chesbro’s 41 wins for the New York Highlanders in 1904, Ed Walsh’s 464 innings pitched for the Chicago White Sox in 1908; Walter Johnson’s 110 shutouts and Nolan Ryan’s 5714 career strikeouts. The current leader in the majors, Johnny Damon, has 94 career triples…and is 35 years old. In fact, since Stan Musial retired in 1963 with 177 three-baggers, nobody has had more than Willie Wilson’s 147. The record for triples in a single season, Chief Wilson’s 36 for the Pirates in 1912, appears safe as well. Nobody has come within 25 points of Cobb, shown right, since Ted Williams retired in 1960 with a .344 average. Among all active players, Albert Pujols is the leader at .334. They said Lou Gehrig’s record of 2130 games played would last for all time…that is until Cal Ripken came along. Don’t see any more Ripkens on the horizon. The Rajah’s record stands secure; the last player to hit. 400 in a season was Ted Williams in 1941. Pete Rose came closest with his National League record 44-game streak in 1978. Tatis is the only man in history to hit two salamis in the same inning. Add in the fact that he did it against the same pitcher, Chan Ho Park, and you’re got a record that will never be broken. This legendary leader list, topped by Mantle, shown left, includes Babe Ruth with 15, Yogi Berra with 12, Duke Snider with 11 and Lou Gehrig with 10. No active player is even close. Speaking of World Series records, Whitey Ford’s 10 wins and Yogi Berra’s 71 hits and 10 championships will be tough to match. One no-hitter is an extreme rarity, but only Vander Meer, a Cincinnati left-hander, ever threw two in a row. He beat the Braves at Cincy’s Crosley Field on June 11, 1938, and four days later no-hit the Dodgers in the first night game ever played at Brooklyn’s Ebbets Field. Another record that should stand for all-time is Nolan Ryan’s career 7 no-hitters. A perennial .300 hitter over 14 seasons with the Yankees and Indians, Sewell’s career rate of one strikeout for nearly every 63 at-bats is by far the best in history. He struck out three times in 1932 — in 503 at-bats over the course of the entire season. Today’s players routinely strike out three times in a game and 114 times or more in a single season. After a thorough inspection of the new Stadium, the SportsLifer has uncovered the problem and knows how to fix it. Listen I’m no rocket scientist, but I work for a company that employs thousands of brilliant engineers and scientists. And my father is a retired engineer. So perhaps some of that engineering expertise has rubbed off. Anyway, here’s my premise. 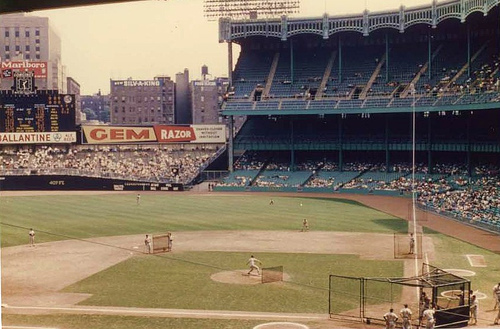 First of all, the dimensions of the new Yankee Stadium are identical to the old one, so that shouldn’t have any impact on increased home run rates. And it’s not as if the new Stadium is located in another part of New York City at a higher elevation with differing weather and wind patterns. Heck, it’s right across 161st Street from the old place. The answer lies in the upper deck, enclosed in the old ballpark but with open spaces in the new Stadium. In fact, on the upper concourse at the new house there is an open gap, roughly 15-feet high. 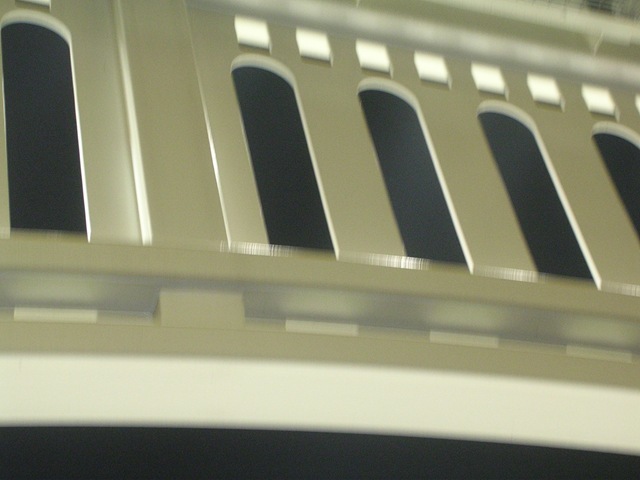 This gap, above the concession stands, allows the prevailing westerly flow entry into the park, especially on the third base side. That airflow is then channeled into a smaller gap, about six-feet high, between the upper deck and the terrace level, where it eventually flows out to right field from the third base side (or left field from the first base side). The majority of home runs in the new Stadium have been hit to right and right-center, which is no coincidence. They have been helped by that prevailing air flow. The solution is a simple one according to this self-anointed engineer/architect. Put up protective tiles on the outside of the ballpark to cut down the wind flow in the upper deck. Problem solved. With a diminished wind flow the home run ratio is bound to go down, and everyone but the hitters will be happy. In an era dominated by Tiger Woods and a field of also-rans, it’s nice to recall a time when real, honest-to-goodness rivalries existed in golf. 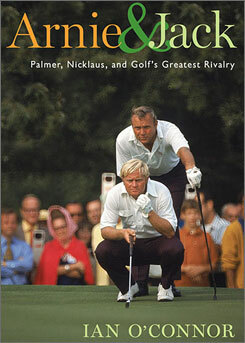 And none of those rivalries came close to rivaling the one between Arnold Daniel Palmer and Jack William Nicklaus. And yet, no matter how many times Jack won or how many majors he dominated, Arnie owned one thing that Jack wanted above all else — the collective heart of the golfing public. In many ways, Arnie and Jack were like older brother/younger brother, the King and the Bear, competitors on the golf course and in the boardroom. It all began in an exhibition match at the Athens Country Club in Ohio in 1958, the 29-year-old Palmer, fresh from a win at the Masters, and the 18-year-old Nicklaus, headed for Ohio State. Palmer won that day, but it was Nicklaus who impressed onlookers with his booming drives. “Arnie & Jack” covers many of the heralded clashes between Palmer and Nicklaus, like the 1960 U.S. Open at Cherry Hills in Colorado. Palmer was a full-blown TV sports star in the early 60s, rivaling Mickey Mantle, Willie Mays and Johnny Unitas. He turned up everywhere from the Perry Como Show to advertisements for L&M cigarettes. Palmer, with Arnie’s Army in tow, trailed Nicklaus and the immortal Ben Hogan by seven shots with just 18 to play — and came back to win the Open. with a 280. Nicklaus’ total of 282 was the best amateur score in U.S. Open history. Two years later, at the 1962 Open at Oakmont Pa. a mere.40 miles from Palmer’s Latrobe, Pa. home, the crowd mocked Jack’s weight calling him “Fat Gut” and “Fat Jack” and “Ohio Fats.” Nicklaus shut out the distractions, silenced the crowd and beat Palmer in a playoff. Nicklaus always believed he was the better player…and history would bear out the Bear. But he never really felt the love of the golfing public until the 1986 Masters, when he finally earned the full adulation of the golfing public. O’Connor’s book humanizes the friendship between Arnie and Jack, a friendship strengthened through their wives, Winnie and Barbara. When Winnie died of cancer in 1999, the Nicklaus family was watching their 30-year-old son Gary attempt to earn his PGA tour card after eight failed attempts. Palmer tried to convince Jack that he should stay with his son, but Jack came to the funeral. After the service, Jack was getting updates on his cell phone. Arnold asked how Gary was doing. “Well, come on, let’s turn on TV,” said Arnie. “You don’t have to do that,” said Jack. “I would want to,” Palmer replied. Gary shot 63 in his sixth and final round.and earned his tour card. Overcome by joy and sadness, the two old rivals fell into each other’s arms and cried. In “Arnie & Jack,” O’Connor brings those glory days and memories, both happy and sad, back to life. I’ve been waiting the past few years to see the new Yankee Stadium. And I’ve been waiting a lot longer — a lifetime — to catch a ball at a game. Friday night I did both. 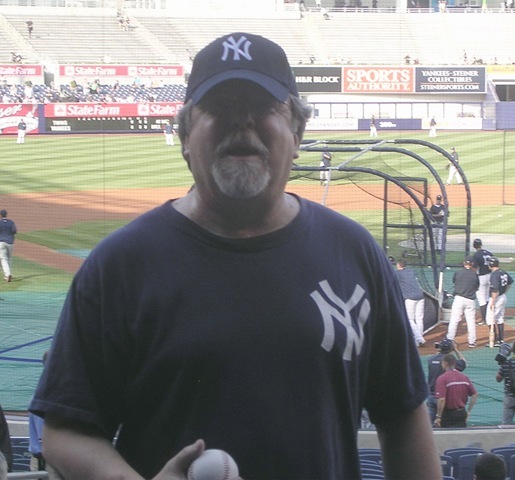 First time ever in the new Yankee Stadium, right after touring Monument Park, I ventured into the lower left field seats to check out the view and watch some batting practice. I wasn’t there 30 seconds when Derek Jeter lined a shot into the stands. It crashed into a seat several rows behind where I was standing, bounced forward, hit off several leaping fans, and popped into my hands as I leaned over the seat in front of me for a two-had grab..
Oh, I’d come close several times, no closer than a home run Bernie Williams hit into the right field seats on the day David Wells pitched his perfect game in 1998. I had that ball lined up and ready to grab, but was shoved by a large fan and missed catching it on the bounce. If you watch replays of that famous game, you can still see me — the guy in the orange windbreaker getting turned around as the ball bounces right underneath his seat. I came close at Candlestick as a kid, and later at Tropicana Field. 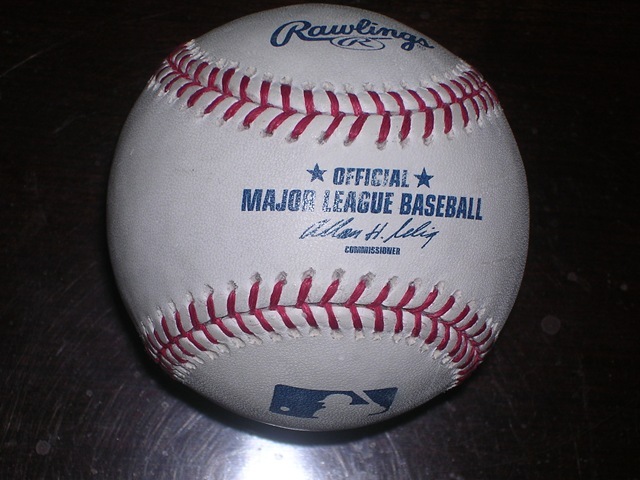 A friend of mine got a foul ball at Camden Yards once, when we were sitting right behind the Yankee dugout. Once during the 2002 Winter Olympics in Salt Lake City, I caught a small yellow ball thrown into the stands and got two free tickets to see the Bare Naked Ladies in concert. Heck, just a few weeks ago I grabbed a Mets’ tee-shirt thrown into the crowd in my first game at Citi Field. But never caught a baseball at a major league ballpark — at least until Friday night. What an introduction to the new Yankee Stadium. Just walked into the place, caught a Jeter BP homer. Feelin’ like I own the joint. The new house is a magnificent baseball palace with wider concourses than the old Stadium, flat screen TVs everywhere, and an incredibly huge, diamond vision screen in center field. Restaurants and bars are located all over the park, a variety of food and drink available. And unlike the old Stadium with separate entrances, the bleachers are connected to the rest of the stadium. But there are drawbacks. There are seats in the bleachers, for example, where you can’t see left field. I’m not talking about the left field corner, I mean left field. It’s blocked by the restaurant in center. There are some flat screens there, but you can’t see left field is left out. Speaking of seats, with all that room it wouldn’t have hurt to put a few more tables around the park for fans to eat — especially in the upper deck. The out-of-town scoreboard doesn’t really allow the fan to follow other ballgames. It quickly flashes scores with confusing team logos, as opposed to Citi Field where fans can follow each game, all the time. Like any new house, the new Stadium needs some getting used to. Eventually the Yankees will figure out the economics of pricing the fancy seats behind the plate, and they’ll start filling the park if they’re winning. The new Stadium is fast developing a reputation as a launching pad, and so far has given up with nearly four home runs a game on average. The night I went, Justin Morneau hit a pair and Joe Mauer one for the Twins. Jeter hit a home run for the Yankees (not the one I caught), and Brett Gardner hit an inside-the-parker, the first for the Yankees in nearly 10 years and the first ever in the new Stadium. The general impression is that the Yankees lost some of their intimidating home field advantage moving across 161st Street to the new grounds. Winning baseball, like the Yankees dramatic ninth-inning rally Friday night to beat Minnesota, will build that home field edge. The crowd was certainly pretty loud when the Yankees were coming back, and the house went nuts when Melky Cabrera singled with outs to drive in the tying and winning runs. First game at the new Stadium, a Yankee win, and a ball. Priceless. I caught my first game at the new Citi Field the other night. Very nice ballpark. Loved the brickwork and the out-of-town scoreboard that shows baserunners and outs so you can really follow the other games. The Jackie Robinson Rotunda is an amazing tribute to Jackie Robinson. Vast improvement over Shea Stadium. Of course Shea was an ugly place to play baseball, almost from the beginning. One of those sterile, cookie-cutter multipurpose stadiums, like Riverfront in Cincinnati or Three Rivers in Pittsburgh, Some good memories with the Miracle Mets, 1986 and all, but not a lot of character. One big distraction at Citi Field is the planes taking off from LaGuardia. Same as the old Shea in that sense. I’ve now been to all three Mets home parks — the old Polo Grounds in Manhattan, Shea and right next door Citi. And I will be seeing the new Yankee Stadium for the first time later this week. The Old Stadium — My first baseball game (1958); seeing Mickey Mantle, Roger Maris and Ted Williams homer in the same game (1960); Yanks-Tigers 19-inning tie (1968); Fourth of July twinbill vs. Red Sox (1973); Sunday doubleheaders. The Refurbished Stadium — Yankees vs. Orioles in the 70s; Donnie Baseball in the 80s and early 90s; Yankees 12, Red Sox 11, 10 innings (1996); David Wells perfect game (1998); World Series victories in 1998 and 1999; Roger Clemens 300th win (2003); Aaron Boone’s homer in 11th inning wins the 2003 AL pennant over Boston; Double rally vs Padres, Yankees win in 12 innings (2004); Yankees tie team record with eight home runs in game (2007); Yankees beat Texas, 18-7, capping run of 59 runs in last four games seen at Stadium (2008). 2. Candlestick Park — Willie Mays hits a grand slam and Juan Marichal beats the Cubs (1962); Giants home opener (1985)..
3. Polo Grounds — Mets outfielder Jim Hickman hits for the natural cycle; Stan Musial pinch-hits for Cardinals (1963). 4. Shea Stadium — Banner Day parade (1967); NLCS loss to Mike Scott (1986); Yankees lose two to Red Sox (1975); Subway Series regular season battles with Yankees. 5. Fenway Park — Yankee southpaw Fritz Peterson wins 20th game (1970); Ron Blomberg first DH, Opening Day (1973); Nolan Ryan 15 Ks (1977); Bucky Dent HR beats Boston in AL playoff game (1978). 6. Memorial Stadium — Dock Ellis lifts Yankees to win over Orioles en route to pennant (1976). 7. Oakland Coliseum — A’s crush Angels in home opener (1985). 8. Arlington Stadium – Tony Pena homers and Roger Clemens stops Rangers on a hot night in Texas (1990). 9. Fulton County Stadium — Giants rout Braves, 23-8 (1990). 10. 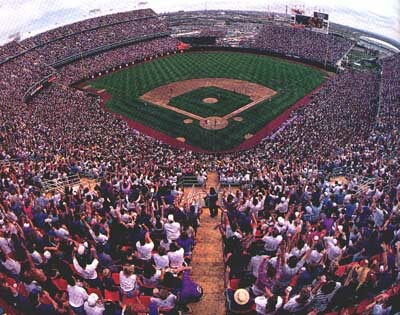 Mile High Stadium — Rockies beat the Mets in inaugural season in Colorado (1993). 11. SkyDome — Two-time champion Blue Jays beat the Yankees at the ballpark now known as Rogers Centre (1994). 12. Coors Field — Eric Young ties modern record record with six stolen bases, 10 home runs hit as Rockies beat Dodgers, 16-15 (1996). 13. Wrigley Field — Cubs and Pirates split a doubleheader; Sammy Sosa hits three-run homer to win nightcap for Chicago (2002). 14. Pro Player Stadium — Marlins beat Braves in near-empty ballpark (2002). 15. Tropicana Field — Rays beat Yankees on walk-off walk in 10th (2002). 16. Pac Bell/AT&T Park — Barry Bonds steals 500th base (2003); Bonds breaks Hank Aaron’s home run record (2007). 17. Metrodome — The Blue Jays beat ace left-hander Johan Santana and the Twins (2005). 18. Camden Yards — Yankees beat Orioles, sit behind Dr. and Mrs. Derek Jeter (2006). 19. Citi Field — Mets score five in eighth, three on Carlos Delgado home run, to beat Pittsburgh, 7-3 (2009). Empty seats are a strange yet familiar sight in the new Yankee Stadium. First, the good news. They still have 26 World Championships and 39 American League pennants in the bank. Now, the bad news. The wheels are coming off the Yankees World Series express. No Relief…When .Mariano Rivera starts to struggle, the Yankees are in big trouble. The best relief pitcher in baseball history has lost some velocity on his cutter, courtesy of a tired shoulder. You have to wonder if, at 39, this is the beginning of the end for the great Rivera. The other night against Tampa Bay he gave up back-to-back home runs for the first time in his career in an 8-6 loss. He’s already given up as many home runs (4) as he did all of last season…and more than he’s given up in eight other seasons. And he’s sporting a very un-Rivera like 3.97 ERA, the highest of his career. The rest of the Yankee bullpen is, in a word, pathetic. Every game is a crap shoot with this group. They can’t get the ball over the plate, and when they do, it gets hit someplace hard. At some point this year the Yankees will need to move Joba Chamberlain back to the bullpen to ensure at least a semblance of consistency. Choking in The Clutch….One thing you can count on — Yankee hitters do not deliver in the clutch. This was a problem last year, but this year it has grown to epidemic proportions. During their five-game losing streak, the Yankees did not hold a lead in any game and were 6-for-43 with runners in scoring position. We’ve seen this act before. And it’s been a problem up and down the entire lineup, with virtually every hitter sharing the blame. Free Agent Struggles….During the off-season, the Yankees spent more than $423 million dollars — that’s right, nearly half a billion in the middle of an economic turndown — to sign pitchers CC Sabathia and A.J. 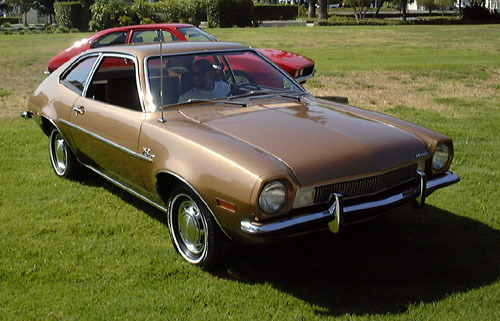 Burnett and first baseman Mark Teixeria (pictured right in happier times) to long-term contracts. Like virtually all high-profile free agent signees with the Yankees, the early returns have not been good. Neither Sabathia (two wins, 3.94 ERA) and Burnett (two wins, 5.26 ERA) have been the stoppers the Yankees expected. And Teixeira has been awful, so bad he was booed repeatedly by the home fans in an 0-for-5 effort the other night. That is what happens to a .192 hitter making $22.5 million a year. Now the Yanks are decimated at catcher, with both Jorge Posada and Jose Molina on the disabled list and no young catching prospects in sight. Injuries are part of the game, and older teams are more injury-prone. That’s a fact. The Yankees knew that coming in and chose to roll the dice with older players. The New House….What’s with all those empty seats? 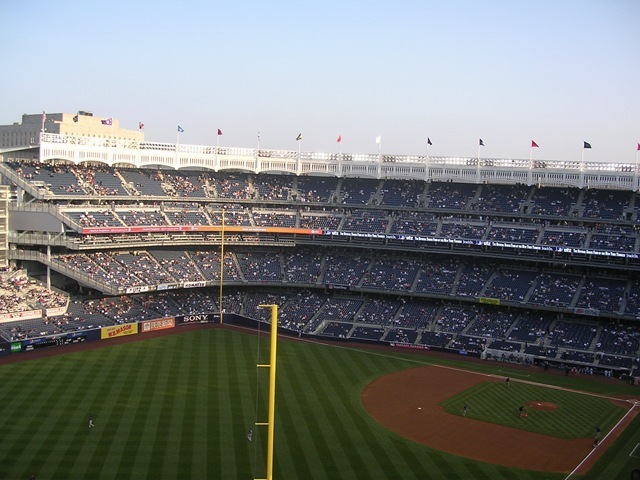 The Yankees have a beautiful new ballpark, but they can’t fill it. They miscalculated their fan base, seriously over-priced the seats behind home plate, and as a result have lost some of the home-field advantage they enjoyed for so many years right across the street. This is a problem, and it’s not going away…but some fans are. The Front Office….If you were given a bigger budget than your competition, and your business failed year after year, would you keep your job? So how does general manager Brian Cashman keep his? Cashman has put together a team that can’t pitch, can’t hit with runners on base, is old, and is lacking in speed and defensive abilities. He has to absorb some of the blame. And Joe Girardi needs to be held accountable too, although to be fair, it’s tough to be successful when your players don’t execute. Still Girardi’s propensity to over-manage can be disturbing. 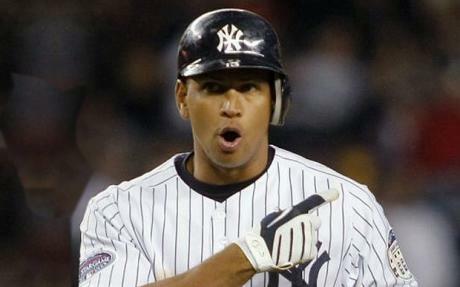 The Lightning Rod…..The Yankees are getting Alex Rodriguez back. Is that good news or bad news? We all know how A-Rod , left, has reacted to pressure over the years. Not very well. His failures in key situations, especially in the post-season, have been well chronicled. But he certainly came though in fine style in his first at bat with a three-run homer. Strange as it may sound, the Yankee turmoil may be the perfect foil for A-Rod. It sets him up to be a hero. If A-Rod can come back and generate some offense, carry the team and produce some victories, the New York fans will love him. So like Bonds in San Francisco, he may be a jerk but he’s our jerk. Fans and the media alike have been piling on A-Rod ever since it came to light that he was using steroid. His eputation has taken a serious beating.. Rodriguez seemingly has nowhere to go but up. The fact that Manny Ramirez is stealing the headlines with his steroid use and 50-game suspension, may actually take some of the onus off A-Rod. Of course, it’s up to Rodriguez and the rest of his Yankee teammates to produce if they want to get back in the race.